Leaves develop unusual patches of yellow and green colour, with thickening and puckering of the leaves. Stems may twist, and stalks may show light yellow soft spots. New leaves may be thin, dark green, and slightly cupped. Like other viruses, celery viruses interfere with genetic signalling within the plant. Leaves that are distorted by the virus cannot function normally, so plants struggle to grow and stop gaining size. Measures that reduce aphid populations will cut the risk of this and other viral diseases in the garden. Grow plenty of nectar-producing flowers to attract aphid predators including ladybirds, lacewings and hoverflies. 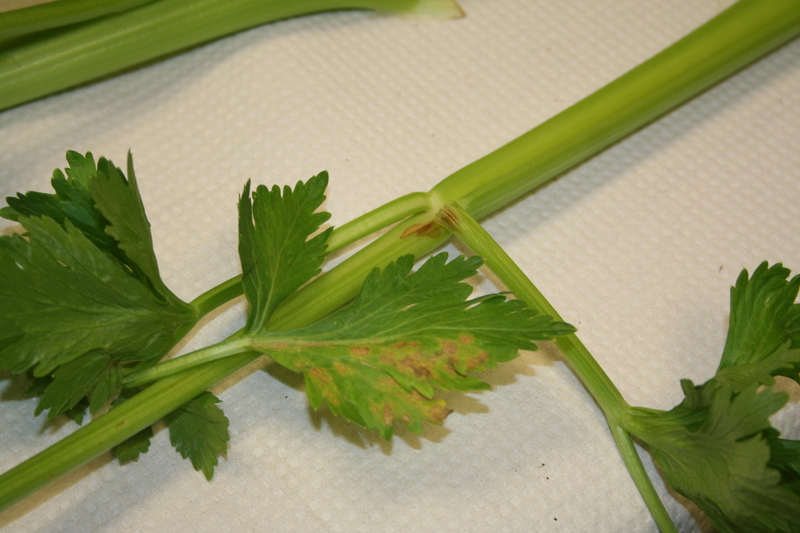 If viral diseases are common in your garden, use horticultural fleece to protect young celery plants from aphids. To keep the problem from spreading, pull up infected plants and compost them. Dispose of any unused seeds, because it is possible the seeds were infected with a virus.